Every year, 6,000 incidences of child abuse and neglect are reported in San Francisco, and more than 10,000 children are exposed to violence. Even in a city known for its innovative thinking and concern for the marginalized, our most vulnerable residents are still at terrible risk. This is unacceptable. There are many local organizations providing exceptional services to those in need, but relevant partners were scattered throughout the city, making it difficult for traumatized children and families to easily get the comprehensive attention they require. What San Francisco needed was an advocacy center for children: a facility consolidating child protective services, criminal justice and law enforcement entities, and medical and mental health workers under one roof. The nation’s first advocacy center model was founded in Huntsville, Alabama, in the 1980s. The idea spread across the country to virtually every major city—except San Francisco. That is, until now. 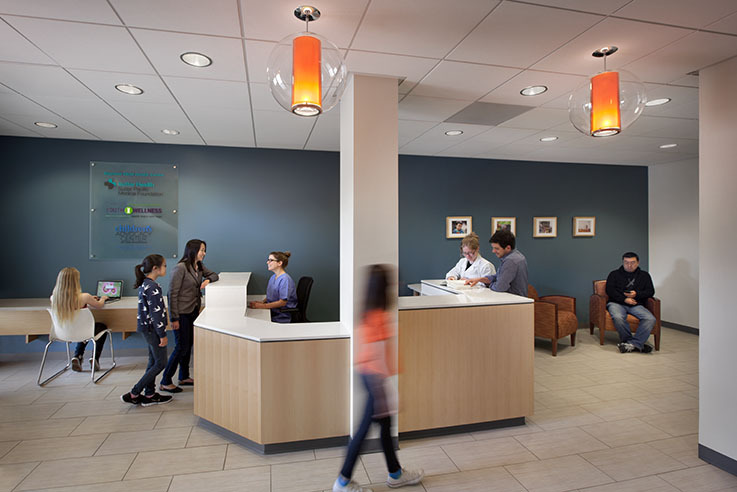 The Children’s Advocacy Center of San Francisco/Center for Youth Wellness Building opened its doors in the Bayview neighborhood in February 2014. Facilitating interdisciplinary collaboration between multiple agencies, it brings together public and private partners—dedicated to helping families and children respond to abuse, exposure to violence, and trauma—to address each case and work together on treatment. A true “village” effort, it is the result of a vision that began with the San Francisco Child Abuse Prevention Center (SFCAPC) and the California Pacific Medical Center (CPMC) Bayview Child Health Center, and implemented in partnership with the City and County of San Francisco, specifically the Office of the City Attorney, Office of the District Attorney, Human Services Agency, San Francisco Police Department, the Department of Public Health through the Child and Adolescent Support Advocacy and Resource Center, University of California, San Francisco, and LPCH. The Center houses three primary partners: the SFCAPC’s Children’s Advocacy Center, which employs best practices in investigating and responding to incidents of abuse; the CPMC Bayview Child Health Center, a holistic pediatric clinic that combines physical health care with psycho-social interventions; and the Center for Youth Wellness, which serves children and families and raises awareness about the toxic effects of adversity on children’s developing brains and bodies. Additional offices in the building are occupied by a number of related city agencies. We got involved in the design of the Center through Tipping Point Community, a San Francisco-based nonprofit organization that fights poverty in the Bay Area. Back in 2008, Tipping Point asked us to help find a home for Compass Family Services, a local nonprofit that helps homeless families. After a long search, we found an old residential hotel that was just right. We converted the basement into a kitchen and childcare area for the homeless to use. As with Compass, the first task was to find a building. We scoured the city for one that would work, led by a dedicated real estate broker, Paul Picciani of Kidder Mathews. Finally we found the right one, a three-story office building with parking in the neighborhood. Locating the Center in the Bayview makes it highly accessible and visible so that those in need are more likely to make use of its offerings. In the design phase, we conducted three workshops with all the partners. Our primary goal was to organize the building as effectively as possible and figure out which services should be located where. Each floor has about 7,000 square feet. 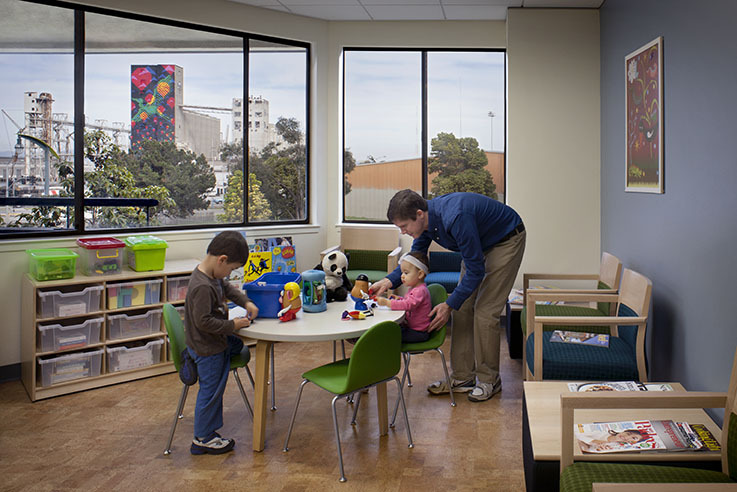 The SFCAPC’s Children’s Advocacy Center has the entire third floor as well as spaces on the first and second. 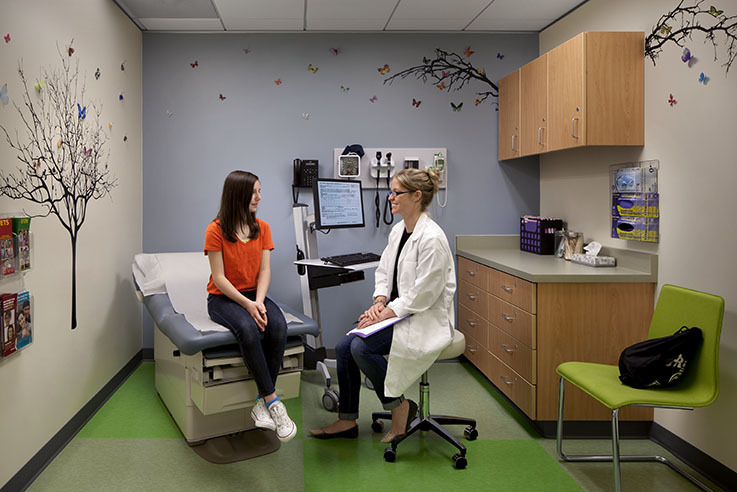 The Center for Youth Wellness has spaces on the first and second floor, while the CPMC clinic is on the second. This way, employees of all three organizations have opportunities to interact. The Center significantly reduces trauma for children reporting abuse. Children and families can come to this facility in a police car, be escorted into a forensic room, and have a medical exam and interview in a safe, comforting space. One-way glass allows police, district attorney, and human services representatives to watch and hear the interview without having to occupy the room and potentially add to the child’s distress or anxiety. This way, the child only has to tell the distressing story once. As designers, our intention was to create a place where kids could feel safe and comfortable. We thought a lot about how people would travel through the building. We created different entrances and routes so that when children and families come in for wellness advice or to see a physician, they won’t cross paths with members of the police force, a potentially intimidating experience. A dedicated circulation system with its own elevator is set aside for kids and families who may be arriving discreetly to be interviewed. We carefully selected color, graphics, and kid-sized furniture to make the spaces appealing to the children who visit. 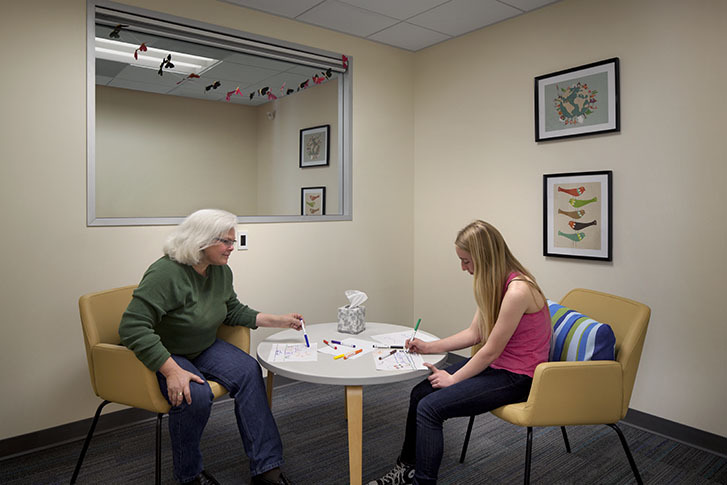 There are separate playrooms and outside space that provide a “respite” moment for kids. We also had an idea of creating a shared learning kitchen on the ground floor where an adult might take some kids to make cookies in the afternoon, allowing the smell of baking cookies to permeate the air—but that hasn’t been built yet. Through continued education and outreach, and through concerted efforts to stop violence against children, we hope to bring a permanent change to the statistics. The opening of the Center is a giant step forward, increasing the ability of these organizations to relieve trauma, bring justice, and help the healing begin.